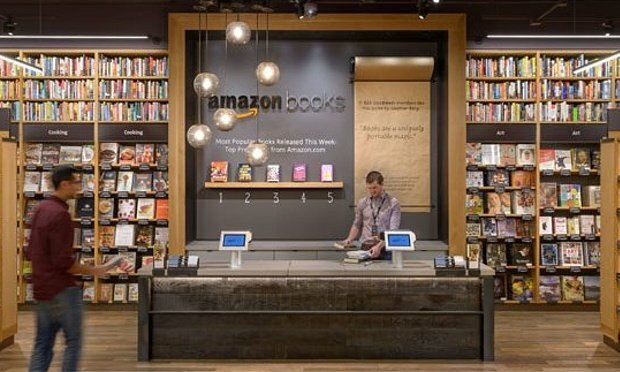 Amazon Books is the very first mass market bookstore the company has ever launched. It opens on November 3 in Seattle and will stock thousands of bestsellers that are rated 4+ stars on GoodReads and the Kindle e-book store. The bookstore opening is described as a “physical extension” of Amazon’s business. It will stock the most popular books from Amazon.com, and the prices will be the same as those offered on the website. Customers will also be able to try out Amazon’s devices, including the Kindle and its Fire TV. Amazon Books vice-president Jennifer Cast announced the online giant would open its “real, wooden doors” at the Seattle University Village on November 3. “Amazon Books is a physical extension of Amazon.com. We’ve applied 20 years of online bookselling experience to build a store that integrates the benefits of offline and online book shopping,” she said. The bookstore will stock 5,000 books in the 5,500-sq-ft space, with the majority chosen on the basis of customer ratings, pre-orders, sales, popularity on reader recommendation site GoodReads, and the store’s curators’ assessments. Tom Tivnan, features editor at the Bookseller magazine, questioned why the online giant was experimenting with a bricks-and-mortar store. “It goes against the Amazon model of being a never-ending bookshop that is not reliant on having books on shelves,” he said. “It is unclear whether they will roll it out across the US. The lines between online and offline are becoming increasingly blurred.